One of our favorite must-have scooter-dealer / scooter repair shop items. Zeibe Moto Cleaners are essential for keeping riders clean and comfortable on everyday journeys. Never worry about a stinky helmet, just use a wipe and refresh. What we consider a scooter shop essential item for any display counter. Grab-and-Go with single wipes. Zeibe Helmet Cleaner is a hypoallergenic cellulose wipe impregnated with a solution specially developed for cleaning the internal fabrics of motorbike helmets. 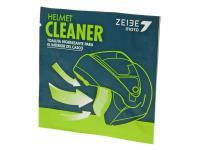 Zeibe Helmet Cleaner wipes eliminate dirt generated by pollution, sweat, make-up, etc and eliminate bad smell in the internal fabric of the helmet.